Videoslots - ▶️ Top Online Video Slots, Play Now! 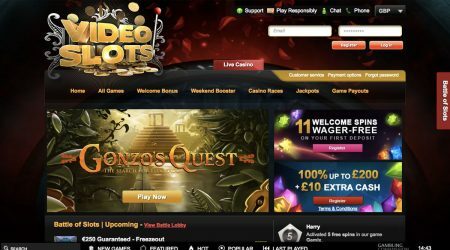 Videoslots casino was set up in 2011, but although that makes it older than many of its market rivals, the site has been regularly updated to take account of new developments in the industry. 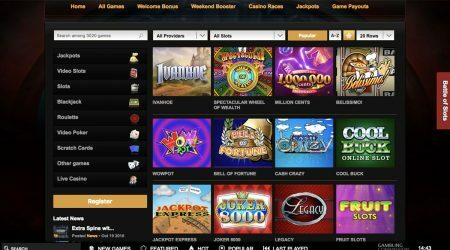 As the name would suggest, there is a focus on slots titles, but the site also claims to offer a wide selection of other game types. 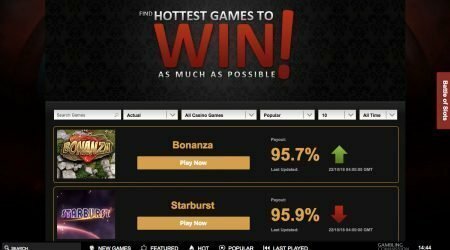 In this review, we will be taking a closer look at the Videoslots site to see just how impressive their game selection is. We will also be weighing up the other key factors, such as banking options and customer service, to give you the complete low-down on this popular site. If you’re a regular online casino player, then you will be used to being offered tempting welcome bonuses for joining new sites, and Videoslots offers a solid introduction for signing up to the site. New players are rewarded for joining with a generous 100% deposit match up to £200. In the competitive online casino industry, Videoslots has produced an interesting welcome bonus promotion that stands out from the crowd. The casino offers a 100% Match Bonus at the time of your initial deposit, which means that the site will match the amount of that first deposit up to a maximum of £200. The bonus is activated automatically as soon as the first deposit is placed into your account. In addition, players who register and make an initial deposit are also welcomed with 11 free spins, whatever the size of that first deposit. Any winnings that you gain from the free spins are free from wagering requirements, and there are no maximum withdrawals for these winnings. Taken as a whole, this has to rate as one of the best welcome bonuses in the industry. As with all welcome bonuses, there are some terms and conditions attached to the Videoslots initial offering. For a start, the minimum deposit required to trigger the bonus is £10. There is also a wagering requirement that means you have to play through the deposit bonus a certain number of times before the funds are unlocked and available for withdrawal. The good news is that the wagering requirement is just 20 times the bonus and deposit amount – a much lower figure than is standard for the industry. In addition, there is no maximum win on the deposit bonus. Not all the games on the Videoslots site count equally towards the wagering requirement, but the precise figure depends on the RTP for each game. For example, games with a 95% RTP will count 125% towards the wagering requirement, while 97% RTP games only count 75%. These wagering requirements are much more player-friendly than most sites in the industry, and will be welcomed by online casino players of all levels of experience. As well as its generous welcome bonus, Videoslots also offers a loyalty scheme package that is one of the most interesting that we’ve come across. For a start, the site has committed to paying back a proportion of the money that it earns from slots games every week. This amounts to 1% of all of the wagers on slots titles, and every one of the site’s players will receive a proportion of that money, according to how much money they have wagered during the preceding seven days. Videoslots members are also able to take part in a wide range of additional activities that offer bonus benefits, including Slots Tournaments and the popular Casino Weekend Booster. The Booster promotion provides cashback offers and bonus funds based on how many bets a player makes during the week, and bonuses earned through this deal are free of wagering requirements. In addition, the site offers a popular Casino Races promotion, which is a great way for players to win big rewards. There is a new Casino Race each week, in which players build up points on the Casino Race leaderboard for every £0.20 they spend on their favourite games, with bets over £1.00 earning double points and £2.00 bets being rewarded with triple points. At the end of the week, cash prizes are given to the leading 6,590 players on the Casino Race leaderboard, while the top players will win a share of the prize pool, which is worth £60,000. This innovative approach to rewarding regular players certainly helps Videoslots stand out in a crowded industry. Videoslots is fired by Microgaming’s Quickfire Instant Play platform, which offers a high-quality selection of the latest, most advanced Microgaming titles, all of which can be played in a browser window, requiring no download or installation of separate software. The Quickfire platform offers fewer games overall than the more familiar Microgaming download offering, but with a much clearer focus on quality over quantity, and with over 200 Microgaming titles to choose from, there should be something to suit every player. Among the games that you can enjoy on the Videoslots site are The Finer Reels of Life, The Dark Knight and Immortal Romance. However, if Microgaming titles aren’t your thing, Videoslots has also added an enormous array of games from a range of other leading online casino developers, including NextGen, NetEnt and Aristocrat, as well as a variety of live dealer casino titles. Altogether, there are over 1,180 games to enjoy on this site, which rates as the biggest selection of games that we have yet come across. Another popular feature of the Videoslots site is the variety of lucrative progressive jackpot titles available, including the world-famous multi-million Mega Moolah game, which has produced a string of headline-grabbing payouts over the years. You can also have a try at landing the big jackpot with Treasure Nile, King Jackpot, Tunzamunni, WOW Pot, Fruit Fiesta and other popular progressives. As the name of the site suggests, the focus here is very much on slots gaming, but table gaming fans are not neglected. In fact, the site does a pretty good job of catering to all aspects of the traditional casino roster, including a range of variants of popular games, including blackjack, European and American roulette, craps, baccarat, pai gow poker, Caribbean stud and casino hold’em. You can also enjoy over 20 video poker games on the site. One of the most impressive aspects of this site’s game offering is the fact that details of the payout rates are provided for each game. This is a much more player-friendly approach than you will find at most sites, which tend to list theoretical generic payout rates. At Videoslots, you can check out the actual payout rate on a monthly or all-time basis, which provides players with crucial facts to inform their slots play. 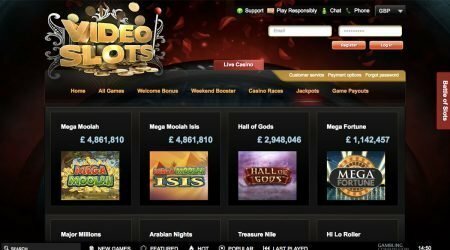 When it comes to slots gaming, there are few sites around that offer the depth and breadth of slots titles or the player-friendly features that you will find at Videoslots. Videoslots hasn’t neglected the importance of offering a range of banking methods for their players. You can make payments and withdrawals using all major credit cards, bank transfers and a variety of e-wallet methods, and there is more good news in that every player is allowed one free withdrawal every day, up to a $30,000 monthly maximum withdrawal limit. If you land one of the major progressive jackpot prizes of more than $50,000, then there is no upper limit. You may find that the first time you make a withdrawal, there is a slight delay as the site verifies your identity, but subsequent withdrawals are generally processed within 24 hours, though it may be up to seven days before the money comes through, depending on your withdrawal method. As with all reputable sites, security is taken very seriously at Videoslots, and all transactions are handled with SSL encryption, so you can be sure that your financial details are protected. From time to time, players may have queries or problems with an aspect of their favourite site, and this is why customer support is one of the most important, yet often overlooked, aspects of any casino. Videoslots offers multiple ways to contact its customer support department, including a handy live chat facility, email, or telephone through its useful call-back option, which means that the casino bears the cost of the call, rather than the player. This is a nice touch, and is backed up by a responsive, friendly team of customer support agents who are available on a 24/7 basis – so no matter what time of day you need help, they can provide it. Videoslots has earned a big reputation among online casino players and it isn’t hard to see why. The casino is able to offer one of the biggest selections of slots games that we have come across, and backs this up with innovative, player-friendly features, including generous regular promotions, smooth and efficient banking, and fast and responsive customer support. Videoslots is a truly impressive performer and a must-visit site for any online casino gamer.